Thunderstorms early, mainly cloudy overnight with a few showers. Gusty winds and small hail are possible. Low 53F. Winds SW at 10 to 15 mph. Chance of rain 80%..
Thunderstorms early, mainly cloudy overnight with a few showers. Gusty winds and small hail are possible. Low 53F. Winds SW at 10 to 15 mph. Chance of rain 80%. 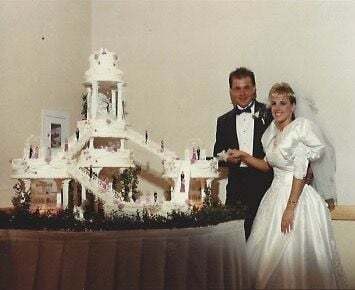 Ted and Renee Schilling pose for photos slicing the first piece of Ida Bruder's custom wedding cake creation at their wedding reception in Schererville on May 18, 1991. Earlier this month, I wrote a column mentioning the passing of local baking legend Ida Bruder, 86, of the tiny neighboring town LaCrosse. She died June 25 and lived her entire life on the farm in the same town where she was born to parents Henry and Bertha Heiniger. Throughout her life, she not only worked with her husband, Dale Bruder, at the family business, Bruder Fertilizer, but she was best known for her business of baking and decorating cakes. After reading a tribute of a couple of paragraphs, many readers from throughout the Region called and wrote remembering Ida's baking greatness, especially her work-of-art wedding cakes. "Hi Philip, I am Renee Schilling of St. John and faithful reader of your columns. I enjoy the The Times and read it every day front to back. I just read your column about the passing of Ida Bruder. Sorry for your loss of this wonderful woman. I wanted to share that Ida did my wedding cake in 1991. My fiance at the time, and I walked into the Villa Cesare in Schererville looking into the hall that may hold our wedding reception. In the corner was this woman putting together this amazing wedding cake for another wedding. I had never seen anything like it. Needless to say, this woman was Ida. She told us where she was from. I was a young 23-year-old, so of course, I had no idea where LaCrosse was! What is ironic is my 20-year-old daughter and her boyfriend were looking at my wedding album this past weekend, and my daughter asked: 'What kind of cake did you have?!' I had to chuckle to myself, because I remember that cake was the talk of the night. I always wondered what Ida was up to these last years and if she was still alive. Her talent will be missed. I have attached a picture of my Ida Bruder wedding cake from May 18, 1991. Thank you for sharing your thoughts and knowledge with your readers. Warm regards, Renee Schilling"
Thank you to Renee and the many others who took the time to share memories and photos. The cakes represented in the photos are similar to my older sister Pam's cake created by Ida, also in 1991 for her wedding, which was a traditional design tiered-tower of pastry perfection, complete with winding staircases, tiny plastic groomsmen and bridesmaids, flowers and real trickling water fountains. In my mind, these are TRUE wedding cakes compared to today's trend of stacked cupcakes favored rather than a cake focal point. I spoke with Ida's son Daron Bruder and his wife Lisa, who are both so pleased to know Ida's work, which she started when she began her baking business at age 43 in 1971, is still remembered so many decades later. I'm told her cake clients spanned a seven-county radius. "When I was too little to be much help, I would just stay down in the basement with mom to provide moral support, if nothing else, while she was baking," Daron said. "In the early days, she just had a regular little oven, so baking took forever. I'd eventually fall asleep down there. She'd wake me up at 2 or 3 a.m. when she could finally go to bed. Then, in time, I helped mom for countless hours as a youngster. Although I enjoyed working with mom, as a young farm boy, I felt at times, it was a bit of a punishment to have to work in a bakery. As time moved on, I and my wife-to-be, both worked with her in the home bakery. Friday night dates working to get the three or four wedding cakes for the weekend done wasn't always what my wife had in mind as a young high school girl. After almost 26 years now of marriage, she passed 'the Ida test' and I've got a keeper! My Dad transitioned and was the best frosting maker in the history of mankind, or at least that's what mom used to say. I had the privilege of helping mom with and going to deliver her last wedding cake in December of 2008. As she was slowing down and did fewer and fewer cakes, going to a store in Valparaiso with her would mean running into at least one person that she had done their wedding, or their daughter's, etc…it was like tagging along with a Rock Star!!! My time with her is a reminder in life of work hard and 'to enjoy the moment.' No trip anywhere or any holiday dinner will ever provide the same memories that working with my folks has for me." I'm grateful to Daron for sharing his family memories today with Times readers. And as a special treat, he has provided the recipe for his Mom's famous white wedding cake icing, with the help of his wonderful wife Lisa's preservation of her mother-in-law's recipe file. "This is close to 'THE' recipe and what I found in her file," Lisa said. "Of course, after so many years, she had her own methods that gave it her 'professional touch,' but these are the basic ingredients, with the varying amounts based on the taste and consistency desired when making it." DIRECTIONS: In a large mixing bowl, combine shortening with salt and powdered sugar and cream together using an electric mixer set to low. When adding remaining ingredients, start with the conservative lesser amount given for flavorings and the canned milk and adjust while mixing, based on desired flavor and consistency required for icing. The boiling water is added during the process as needed to also control the desired "thickness" or "thinness" of the icing. Once desired flavor and consistency is reached, increase mixing speed to achieve a smooth and creamy icing ideal for frosting cakes. Ida said something as simple as "the humidity on the day of doing the baking and frosting" would affect what was required of the icing she needed on that particular day. And because Ida did first and second icing coatings of her cakes, she also created varied icing consistencies as needed. Makes enough icing to generously frost a layer cake. Cherry season is short. But it offers a splash of tree-laden fruit flavor and color to summer.